Today was the first time since I left that I've connected the net; it's been five days. (This picture shows the rigamarole I've gone through to get wired. The red outline surrounds a Spanish telephone wall plug - thank goodness they use the same RJ-11 modular phone plug as we do in the USA. The yellow outline surrounds "TeleSpool", a roll-away phone cord that came as part of a "James Bond" do-everything phone kit for the traveller (that I'll review in depth later). The green outline surrounds my trusty MultiTech ZDX 28.8 kbps modem. All three items are tenuously connected and lying on the rug in my uncle's office.) Over 700 messages waiting for me, including several applications, and I can't connect faster than 9600 bps because of the poor telephone lines between the island and the Spanish mainland. Sigh. Life here has a very different pace than does San Francisco. It's far less hurried, and there's a lot more time for speaking with people. Por ejemplo , today we picked almendras from the almond trees that are scattered around my uncle's casa . (Actually, beat them out of the trees with long thin sticks is more truthful. There's no glamour in almond "picking".) The picture at left is of my uncle Daniel expertly beating the wily nuts into the black tarp we spread over the dry, rocky ground. Eivissa isn't a lush island in the same manner as Hawai'i is - both are tropical, but the former gets far less rainfall/moisture. You can see the brown, dusty earth, covered with rocks, the occasional patch of grass, and the even rarer tree. Wood for building must be imported - a local eccentric shipped in a huge load of Oregon pine. You can also see the light, fluffy clouds. Late afternoon wind is a recent feature of the island: it blows the clouds away and extends the amount of time the sun beats upon the earth, further drying things out. The local paper, Diario de Ibiza , reported that the almond crops have been severly impacted this year; bad news for an economy that has few base resources. Millions of tourists visit the Beleares islands each year, but they take an environmental toll on the island, and are the subject of constant governmental discussion. 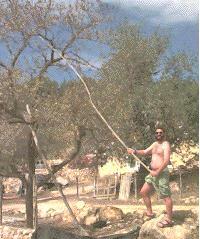 Compared with the relaxed, languid, almost professional almond-hunting stance of my uncle, 1995 Eivissa (Ibiza): My expresso-inspired frenetic cityfied tree abuse is evident in the picture at right. I think the hot midday sun was baking my brains a wee bit: as this picture was being taken I was wondering if there was a market in taking pictures of tourists with the almonds they "caught" (something like what they used to do with shark or marlin fishing). 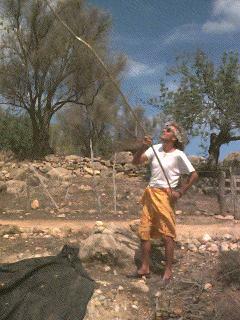 Still, in spite of my agricultural impairments, Daniel and I were able to bag several kilograms of nuts. If you've not had the pleasure of dealing with almonds just off the tree, let me tell you what you face: they're enclosed in a leathery pouch that splits open when it's time to harvest, exposing a rock-hard middle layer of hard nut carapace. Extracting the almond from this protective layer takes almost as many calories as one gets from the almond. (There's no glamour in any stage of negotiations with almonds.) Dinner this evening included a wonderful salad with a light dusting of, you guessed it, almonds. Mmmmmmmmm. Shraddha does more than "just" the housework. In addition to participating in the family tienda - for which I'm now writing up commercial web pages for all of you who want an ecologically responsible local experience - and making beaded jewelery that's for sale in many places on the island, Shraddha also tends to a small garden (pictured here). At left are the papyrus, which survive in his harsh dry environment in spite of their preferred environment of being submerged in the banks of the river Nile. (The left-over water from washing dishes is dumped over them, as is what's left from the dog's and cat's water bowls before they're refilled.) In the middle you see Shraddha, sweeping the walk, wearing the ubiquitous luhng-gee . Behind her is the wooden entrance gate. Behind that is the dirt road that leads almost a kilometer to the main road, and behind that, on the other side of the valley, are the hills that surround the house. The trees on the hills are representative of the gentle balance between sustaining life and becomming completely arid. At right is just part of the little garden. My favorite inhabitant is a wild melon that found it's way into the garden. It's growing slowly, but has recently become the object of attention of my youngest cousin, Djamal, who is just 18 months old, and a real whirling dhervish. It's an open question whether the melon will survive Djamal to grace the dinner table.